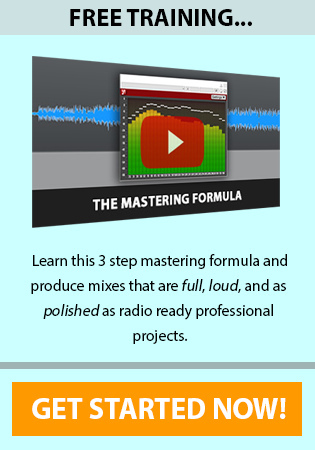 How to set recording levels in your recording projects is certainly a frequently asked question. Later this week I will be releasing a podcast episode going a bit more in-depth at how to avoid clipping. For now, I want to share a brief post outlining this very simple but crucial process. Years ago when analog recording was the rage (if it ever was), knowing how to set recording levels seemed a bit more challenging. Too low of a signal from your source meant lots of background hiss and noise. Too high a signal from your source resulted in nasty pops and crackles known as clipping. Today the results of improper levels can be the same and even worse with digital clipping. Yet setting the levels in digital audio recording is much simpler and more forgiving than in the days of analog. One main benefit of digital recording is the low-level of background noise to signal ratio. Even so, getting the levels right when you're recording a track is still very important. 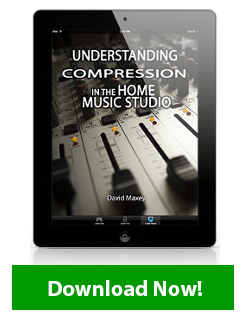 Understanding how to set recording levels will keep those nasty digital crackles and pops out of your projects. So let me give you a little direction on how to set recording levels. First, keep your input signal peak between -12db and -6db. This will typically provide the best signal to noise ratio. It will also assure that your source signal has enough peak room to stay out of the clipping range. Second, start from the beginning. Here's what I mean. Make sure to set the input level on your audio interface at this same point (-12db to -6). It is important to keep this level at the source and work your way back to the DAW input. Your signal should be set properly at the input of every device in your audio chain. Are you using a preamp before your audio interface? Make sure to set the level properly here first. Next check the input signal of your source connected to your audio interface. Make sure the level is set properly here as well. Some audio interfaces do not have a level meter with more than 3 led signal bars (some only have 1). Often these same units will be green/yellow when the signal is present and then turn red when it clips. If this is the case with your audio interface there is a simple way to properly set your levels. Push your input source signal until it shows clipping, then back off the input about 6 db. From there just make sure your meter never turns red even at the loudest points in your audio source. Knowing how to set recording levels from the beginning of your source to the recording signal on your DAW is simple yet critical. Get this part correct and you will have plenty of good clean signal to process in post production. 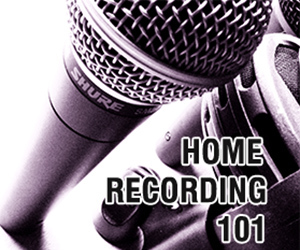 For a more in-depth look at how to set recording levels be sure to check out the podcast feed later this week. Also I would love to hear your thoughts and comments about this topic. Please add them to the section below. 24 replies to "How to Set Recording Levels"
Is anyone explain clearly how to set the gain staging in any Daw while you recording vocal? I mean do I need to put the gain plugin and set it -10 while I record my vocal? 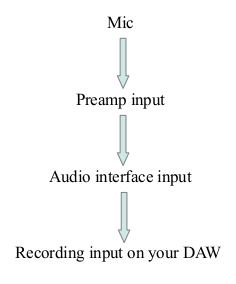 I use of course pre amp on my vocal and a bit external hardware compression. I know how to set the preamp but what about the gain in DAW? Is it highly recommended to use first -10db plugin while you recording and after when you mixing the vocal either? That’s very important issue.. In Logic X all the Software instruments having a very high signal, why is that, if it should be around -18db to -6db as default? Hey Dave. Gotta say thanks so much for everything you’re doing with home music studio1. keep the podcasts coming! I am running pro tools 12 with an Mbox3 and I want to use an Aurora Audio GTQ 173 style)mic pre but not quite sure how to achieve the full potential of the analog gtq2 pre. 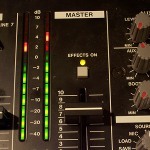 Is there a relationship between the gain on the mbox interface and gain on my outboard unit? Really great article. I was just curious if there is a minimum or recommended signal to noise ratio when recording audio? Someone said the Rode engineers have said the separation or SNR should be at least 18 dB. Have you ever heard anything like that? Is there any rule of thumb about a minimum snr? I’ve been recording acoustic guitar with 2 Sennheiser e614 mics going into a Scarlett 2i2, then into Logic X. Here’s the issue: the only way I can get any gain at all is to have the mics literally inches from my fingers or the bridge. It’s distracting as a player, the mics picks up my finger noise, and I still can’t get even close to the gain you advise in this article. I love the mics, but if I added a mic preamp in front of the Scarlett, what sort of mic preamp should I use and how would I work with two interfaces that could both have phantom power? I’m just now breaking into the multi-track world. Your advice makes perfect sense. Does your -12 peak recommendation apply to every track/ instrument? Should it be vary by instrument? ie HiHat, kick, snare, flutes, guitar amps, lead and background vocals, etc. So yes it apply to every track with one small exception. When I’m tracking a life kit, I prefer to track it close to the levels I’ll mix it at. So typically that means kick/snare toms hit the -12 peak just fine but a hi hat mic may be less and that just fine. Even if your peaking at -18 on other tracks your still good. A drum kit is one instrument with many elements. For all other tracks I still shoot for the same levels. Do you need a pre to get a nice clean sound, nope. If you do pick one up you’ll actually have another piece of gear to learn how to tweak. Sometimes this can push you in the opposite direction your trying to go if your not careful. That said, the right preamp, can be very easy to get a great sound with. One benefit of a preamp is your audio interface gain can be much, much less, and thus, you often will get a very clean signal. As far as which one to choose? Well, lower end pres are not really worth it to me (that $50 range new). There is really only one that I consider to be a perfect fit for the home studio for both quality, features, and price. That’s the DBX 286. The newest model is the 286s, however I have the older model that I found used on ebay for $80, that’s the 286a. You can check out the newest one here. http://amzn.to/1URjxR2 This puppy is amazing quality for the money hands down and I highly recommend it. I got a focusrite ISA one used for around 315. Honestly one of the best purchases Ive ever made. Pretty cheap for a great sounding preamp! Hi, thanks for the great info. My question is–I record music where the vocals have a lot of change in dynamics. My style is to have very subtle phrasing and then build to a belt. Problem is, how do I account for these two? A level that may be good for simple phrasing can low up with a power note. So in most cases I’d still shoot for an input signal between -18db to -6db max. 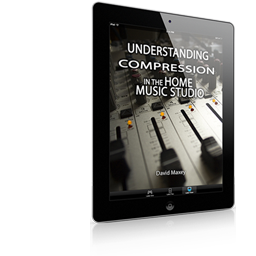 Once your track is in the project, you can then level it out more with a few difference styles of compression. Sometimes a vocal line that is very drastic and also use compression on the tracking side to start leveling things a bit. You can also just edit the wav inside your DAW and increase the gain a touch on the quieter sections. Lastly, for the vocalists, try riding the mic a bit to balance the signal out on input as well. Backing off in the louder spots just a touch to naturally smooth out your peaks. I’m currently set up in my home studio with a Saffire Pro 40 and OctoPre MkII Dynamic for drum recording and also use an Eleven Rack to record my guitars (sometimes miking a cab for guitars). When I’m recording, I’m usually peaking between -12 and -10 and staying at a general range of -14 to -12 average recording level. I’ve heard from lots of other sources that recording should stay between -18 and -12. So I’m thinking my range is pretty good for that yes? I’m using Pro Tools 11 and when I record I’m using the 32-bit float over the 24-bit. Does that really make much of a difference when recording? I know that’s not really part of the article but I was just curious. Hey Shawn, your right on the money as far as levels go. On 32bit/vs 24? I typically don’t set my bit rate higher than my audio interface supports and thus prefer 24 bit. This basically means there is no need for up conversion and I prefer to not use any more processing than needed. I don’t think you’ll notice a difference honest at 32bit float but I’d try some experiments and see. Hope this helps. I am using Presonus 16.02 mixer. I get a bit too much noise from the mic(background) I think the mic picks up unfortunately a way too much noise from my pc fan… Can it be too high gain level set on the mixer preamp? Should I put some more db on the preamp or -6-12 is the ultimate setting and I stick with that? When it comes to levels, the -6 to -12db are peak points. In other words, you don’t have to hit these often to still get good clean signal. Only use as much gain as you need to hit around 50-60% input levels since your computer fan and room is not perfect (mine inst either by the way). Pre-amps typically have multiple stages of input gain, with headphones on (set their volume to about 80%) you can listen and bring up the gain until you start to hear the second stage or higher hiss kick in. This is just for a reference point. So if you can keep your gain out of that area and get enough signal (50-60%) with the gain set at a quieter point, than your fine. A few things with the SM58; try taking off the metal element housing and recording your guitar that way (similar to a SM57). Experiment with it pointing straight at the place where your neck and bridge meet but about 8-12″ away from the guitar. Slight adjustments make a big difference and the closer the mic is the more difference a left right movement will make. You may need to move the mic slightly one way or another to get a balanced sound. Also the closer the mic is to the guitar the less room noise, the trade off is the more noise of the body you’ll get which is not always a good thing. Distance is my preference for a more balanced tone (the 8-12″ straight out). For a touch more lows, move it slightly toward the body more. The opposite for a brighter sound. Lastly, Make all your adjustment calls by listening to the wav in your DAW, not solely by the monitor feed of your source. Many headphone amps add noise (as does the rest of the recording chain) that won’t be as present in the recorded wav. Let me know how it works for you and thanks for the question. Now i play the whole beat from Mpc to Scarlette near clipping (analog). On the front panel of Scarlette theres a green light that shows -18 and a red light that shows 0 if its clipping. Is that signal calibrated already then? even if the meters inside the scarlette mix software shows near 0. The input of the track in cubase still show near o dbfs? If i lower the track fader in scarlette software or its master fader, the input level in cubase doesnt change: I have to lower the overall stereo input fader (not the track fader) in cubase to get -18. Is this correct or is the level from scarlette to high if i have to lower that stereo input fader in cubase. And what is the best recording level for hardhitting drums with sub-bass. Thanks for your question Anders. The green/red light on the scarlet is calibrated with the input db meter within your DAW. When your recording an armed track in cubase, your meter is showing the input signal level of the Scarlett itself. To properly adjust this you would do it using the Scarlett gain knobs on each channel respectively. If you can’t get the input signal low enough simply turn down the output of your Mpc. Regardless, I would recommend setting your input gain on the Scarlett at a peak value of -12 db for recording. I know this seems low but in the digital world it’s much better to record with less gain and around 60% signal than to follow the analog mindset of pushing it as hot as you get without clipping. At -12db you will have a really clean signal in Cubase. You can normalize it hotter (-3db or so before compression) in post production. Hope this helps you out. Have a good rest of your week. I like the site and podcast! Thanks for sharing. One thing that Im always not so clear about is that I have one of those audio interface for rec / stand alone mixer for live application the motu Ultralite. I want to create an easy set up that I can just use my input levels in a live show and then when I need to record I can do that right away. So should I set my levels like the analog way, on the device, seeing where it clips and then back off, or should I be trying to make sure my levels are bettween -12 to -6 on the device. I want to have a strong enough signal source for the live output, but of course when I record I dont want it to clip. Sounds like you’ve got a cool setup there NC. Great question, I’ve used my ZED14 (http://tinyurl.com/9evp2dr) to do much the same thing. Run a live show then record the mix via the USB out (2track). It can be a tricky mental game to overcome but the truth is even though your analog on the live side, but it’s digital on the record side. That said there really isn’t a need to push the levels hard to record. Digital is so much more forgiving here. I also see that the MOTU Ultralite can record up to 24/196kHz. If you stick with the 24 bit side you have even more headroom to record for your levels. All you really need is a decent signal and you’ll have what you need to edit in post. Bottom line, I would shoot for a recording peak of -12 (in 24 bit mode). In the end you’ll still have a good clean signal to work with and you have room for the live dynamic without clipping. Hey bump me back any more question you might have. Hope this helps. Great site and loving the podcast! Welcome to ITunes, bro! Looking forward to hearing from you way into the future! Hey Kern Thanks! Keep in touch.